Charged up: Sakti3’s Ann Marie Sastry is developing ways to mass-produce lighter and cheaper batteries. 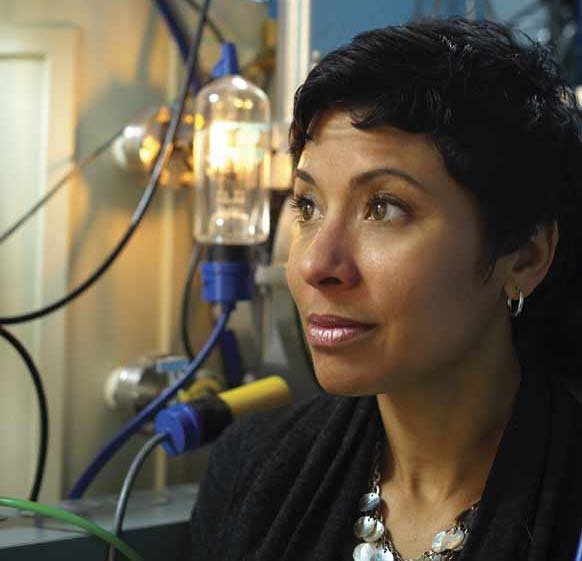 Ann Marie Sastry wants to rid electric vehicles’ battery systems of most of the stuff that doesn’t store energy, such as cooling devices and supporting materials within the battery cells. It all adds up to more than half the bulk of typical lithium-ion-based systems, making them cumbersome and expensive. So in 2007, she founded a startup called Sakti3 to develop solid-state batteries that don’t require most of this added bulk. They save even more space by using materials that store more energy. The result could be battery systems half to a third the size of conventional ones. Cutting the size of a battery system in half could cut its cost by as much as half, too. Since the battery system is the most expensive part of an electric car (often costing as much as $10,000), that would make electric cars far cheaper. Alternatively, manufacturers could keep the price constant and double the 100-mile range typical of electric cars. The limitations of the lithium-ion batteries used in electric cars are well known. “Most liquid electrolytes are flammable. The cathode dissolves,” says Sastry. Keeping the electrolyte from bursting into flames requires safety systems. And to extend the electrode’s lifetime and prevent heat buildup, the battery must be cooled and prevented from ever fully charging or discharging, resulting in wasted capacity. All this adds bulk and cost. So Sastry wondered if she could make a battery that simply didn’t need this much management. Sastry’s solid-state batteries are still based on lithium-ion technology, but they replace the liquid electrolyte with a thin layer of material that’s not flammable. Solid-state batteries are also resilient: some prototypes demonstrated by other groups can survive thousands of charge-discharge cycles. And they can withstand high temperatures, which will make it possible to use materials that can double or triple a battery’s energy density (the amount of energy stored in a given volume) but that are too dangerous or unreliable for use in a conventional lithium-ion battery. Sastry is aware that success isn’t guaranteed. Her field is something of a technological battleground, with many different approaches competing to power a new generation of cars. “None of this is obvious,” she says. An intelligent, gracious and beautiful woman at the head of a leading edge technology company. How refreshing. I wish you plenty of success and many breakthroughs for years to come. I agree but would simplify with: she's hot! Wouldn't it raise the security risks of car if the solid state batteries are controlled by a programmable chip to control the temperatures of liquid electrolyte. I mean if someone can access those programmable chips or even access it either being not programmable, they can be manipulated to disrupt the chemical reaction taking place in batteries, resulting in their explosion. No matter, how secure the resilient materials are used and electrolyte is guarded with any thin layer for less inflammability, anomalies always exist. Well, I appreciate her looks, but I am none the wiser about her batteries. Young man, maybe you opened you eyes too wide, keeping your ears too closed? 100-mile cars? Check out teslamotors.com for 300 mile cars. Beginning to deliver to its large pre-reservation list, which is starting to grow faster than ever. Also setting up FREE long-distance fast-charge network (Superchargers) here and world-wide. Automotive.com 2013 Car of the Year. That's pure battery, btw; no hybrids. It's true, Brian, that the Tesla S and matching Supercharging network is marvelous technology. It's the current gold standard for EVs. But I think you've missed the main thrust of the article. One way to control this is with a liquid thermal management system. Tesla and Chevy's Volt use this. They seal all those foil pouches inside a big metal box and circulate a water/alcohol mixture around them. Just like an internal combustion engine, you've got pumps and radiators to complete the package. But all this adds weight and expense. Passive air cooling of the battery pack (cells inside a slightly smaller metal box, with cooling fans) is cheaper and lighter in weight than the liquid method. But it's a less than optimal solution in hot climates, as recent experience has shown with Nissan Leafs in Arizona, where some passively-cooled battery packs are now showing premature aging. What Ann Marie and others are wanting to give us is a battery that uses a solid electrolyte: one that operates at temperature extremes far exceeding what liquid electrolyte cells will stand up to. Thus, no need (it is hoped) for any sort of thermal management system. Consequently, the battery pack becomes lighter and smaller for the given power and energy density. The current 300 mile range Tesla S could easily become a 500 mile one, while a current 80 mile range Nissan Leaf could do 150 miles or more per charge. I'm sure this technology is expensive now, in it's experimental form. But it has the potential to be less expensive than what is now available, due to simplified manufacturing of layering solid sheets and not having to assemble liquid-filled foil baggies. Economies of scale (ie: making lots of them) will bring the price down as well over time. Finally, if you puncture a current-generation liquid electrolyte lithium cell with an ice pick, watch out. At best, you'll have toxic smoke spewing out. At worst, a serious fire to go along with the poisonous fumes. A solid state electrolyte battery will simply short out and stay inert given similar abuse: no smoke, fumes or fire. Ann Marie is one of my new heroes. We need more people like her! This is Exciting! Imagine this technology used in consumer electronics! Long life, long charge cycles. This very well could be the best battery technology yet! I'm all for affordable and reliable electric vehicles!